Happy Thursday Everyone! 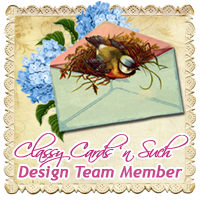 I'm back with another card using the 3D Art from the Classy Cards N Such Online Store. These 3D flowers are so easy and fun to put together. The die-cut sheets are numbered so it's super easy to put them together. I used a new paper pad from Glitz Designs called Graced with Lace. 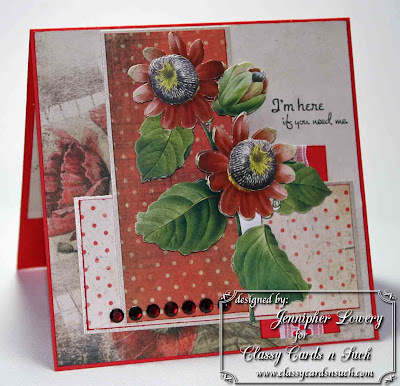 I loved how the red flower in the background blended with my 3D flower. 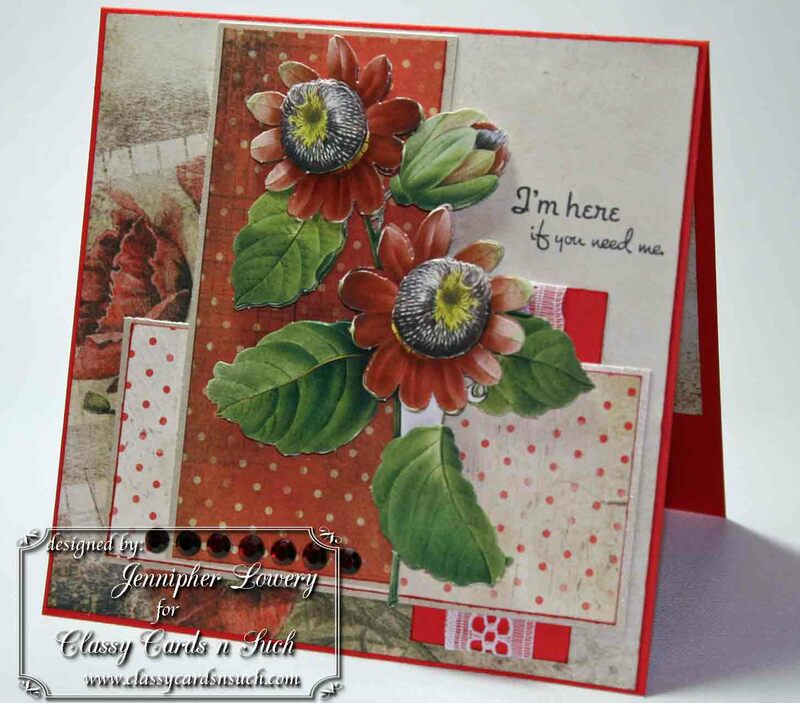 My card base is Poppy Parade from Stampin' Up!®. Just love that orangey-red color and I'm going to have to stock up on it before it goes away. 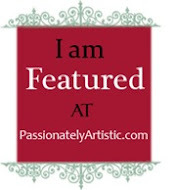 The eyelet trim is a gift from my friend Sarah over at My Little Somethings who just happens to have some awesome blog candy going on right now! You should definitely pay her a visit. 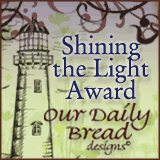 Stampin Sisters in Christ: Challenge: Let's use something new on our card/project this week. 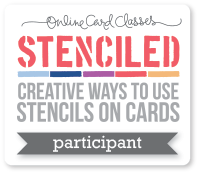 It can be a new stamp, paper, or embellishment...or even a new technique or an idea that is new to you! Just have fun with your creation!! Creative Card Crew: Our challenge for this fortnight is Seeing Red. We want to see red as your primary color. Jennipher, this is OUTSTANDING!! So lovely. Love all the DP you used on this and of course those 3-D images are fabulous. I don't know which is prettier, the DP or the 3D flower! Guess I will have to love both!! Gorgeous card!! Very pretty card. Love the colors too. Hi Miss Jennipher! 8-) What a Gorgeous Card you have created! Wow! Love the Lovely dp's and your 3D flowers are Fantastic! Sure hope you and your Mom have been doing Wonderfully! wow Jennifer this is so so amazing...I love these amazing flowers and amazing layout...so pretty.. Your papers really set off your incredible flowers! Love where you placed your sentiment! Love it! What a pretty card! I love those 3D flowers and gorgeous dp. With a thoughtful sentiment like this, I can't think of anyone who wouldn't love to receive this beautiful card! This card is ooohh so pretty....I also LOVE the bright colors. I need to learn more about card making..
What a beautiful card! Your flowers look so REAL *Ü* Thanks for joining us at Stampin' Sisters in Christ challenges! Oh this is gorgeous Jennipher! I love your 3D flowers and that wonderful sentiment!! Very pretty, love those flowers! Gorgeous card! I love the flowers, they almost look real! Thanks for joining us at PCJ this challenge. Very pretty card, it all goes so well together!